As another year progresses, a look at what progress has been made in improving cycling facilities in the Davenport area. Some things have happened, after a small budget for 'minor improvements' was made available to the Stockport Council cycling team. 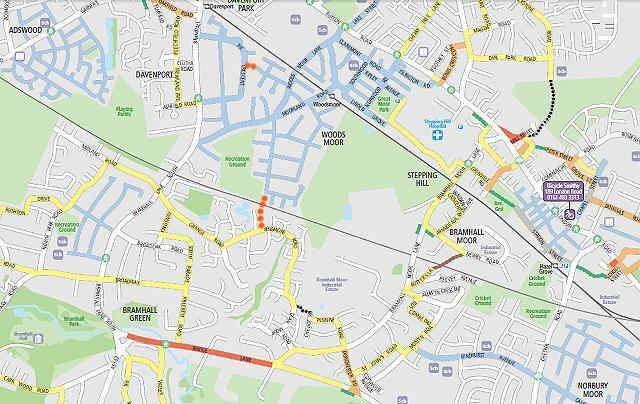 In particular, our suggestion that the bridge over the railway between Cromley Road in Woodsmoor and and Ringmore Road in Bramhall should be opened up for the use of cyclists has been adopted, and at the end of June 2013 the work is complete. This makes possible several routes avoiding Bramhall Lane, without using the awkward and narrow footpath subway under the railway. Up to now the bridge, which once connected two parts of New House Farm, has had a steel barrier on top with a gap just wide enough for a thin pedestrian; See our 'Lost cycle routes' article. 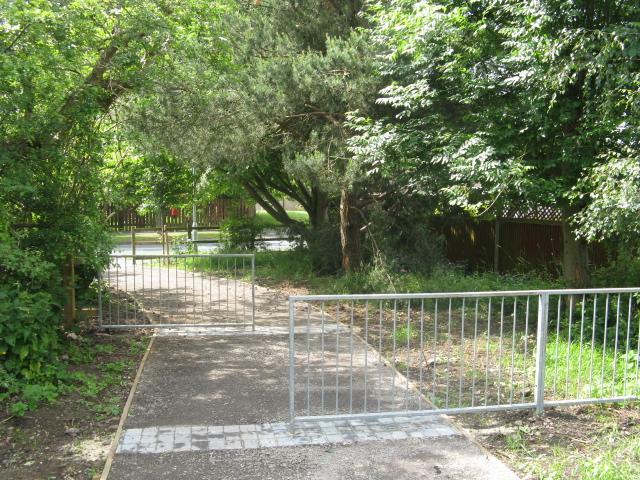 Most of this barrier has niw been removes to make way for the three-metre wide pathway. 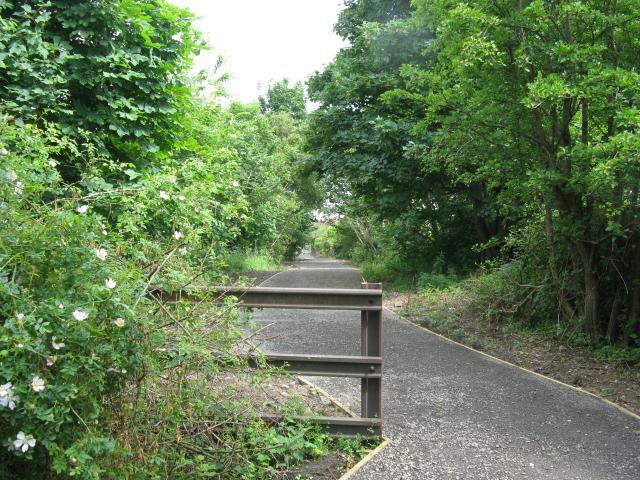 The path starts at the junction of Kinross Avene and Cronley Road (above). Looking back towards Cromley Road. 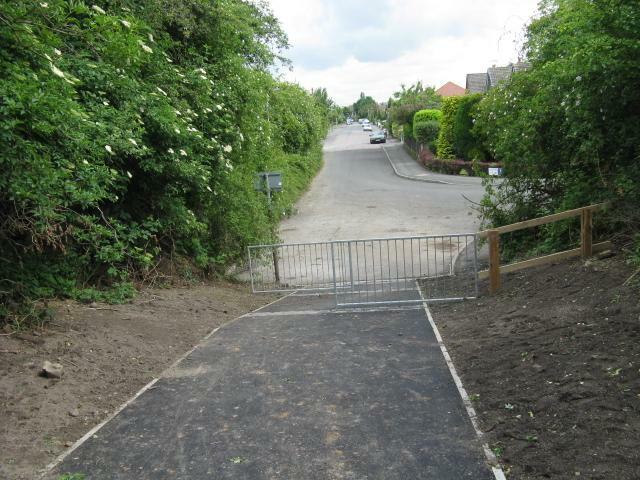 Earth has been removed to ease the gradient, and tarmac laid on the steepest section. The remains of the barrier on top of the railway bridge. The railway itself is invisible behind the undergrowth and the high parapets of the bridge, which was built in 1901 for the Midland Railway Company. From 1901 until 1974 the railway formed the boundary between Stockport and Bramhall (later Hazel Grove and Bramhall Urban District). The view from Ringmore Road, which is part of the 'New House Farm' estate built in the early 1980s on the site of the farm of that name. 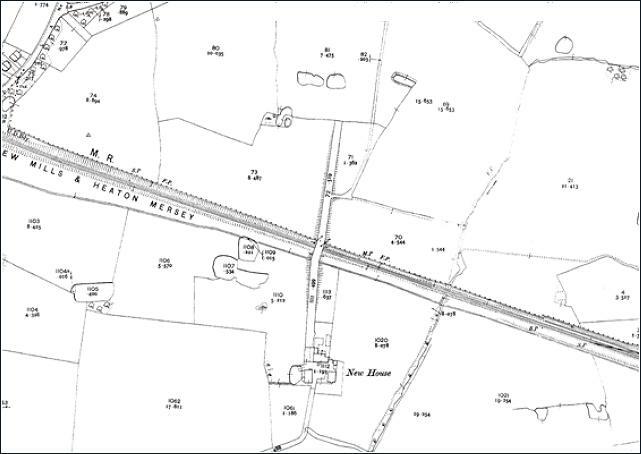 The area in 1910, showing how the bridge was provided to link the two parts of the farm. 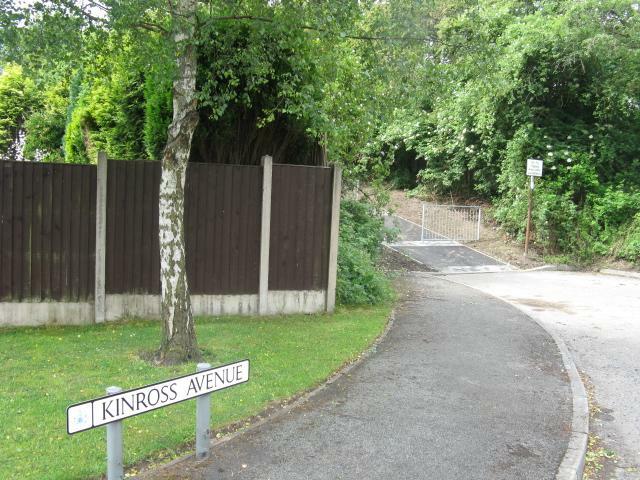 A similar bridge linking Grange Farm with Yew Tree Farm to the west of Bramhall Lane, which could have been retained as en extension to Barnfield Road East, has been demolished, apparently in the 1960s when Manchester Corporation purchased Grange Farm for housing development. Nobody at that time predicted how busy Bramhall lane would become. 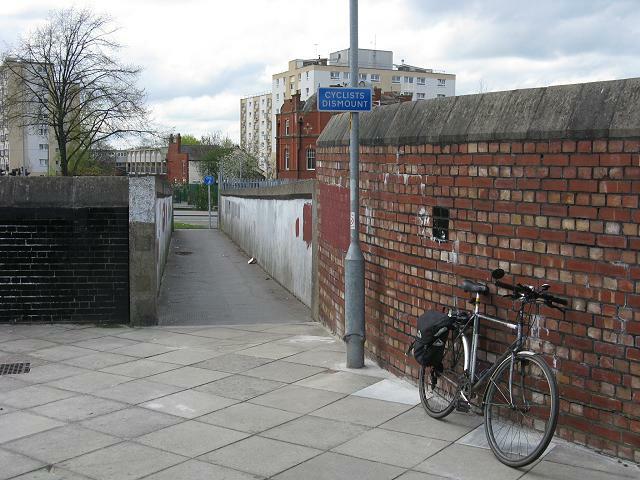 Another suggestion we made for the same scheme was to create a 'dropped kerb' on Thomson Street, part of the signed cycle route from the Town Hall towards Edgeley via a bridge over the railway outside Stockport station. 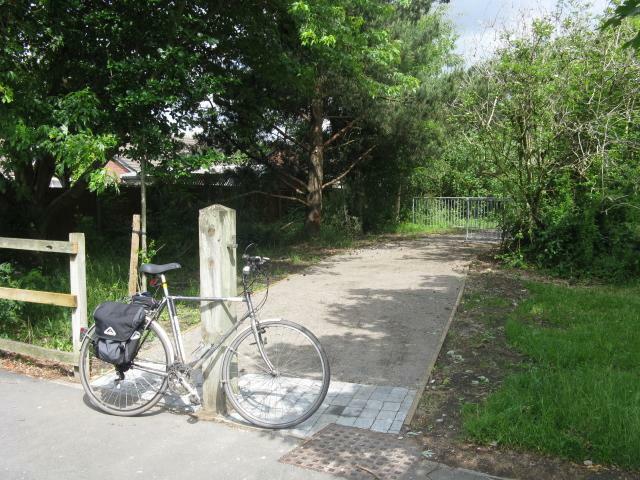 This has been done, as this picture shows, and accompanied by some 'shared cycle route' signs. 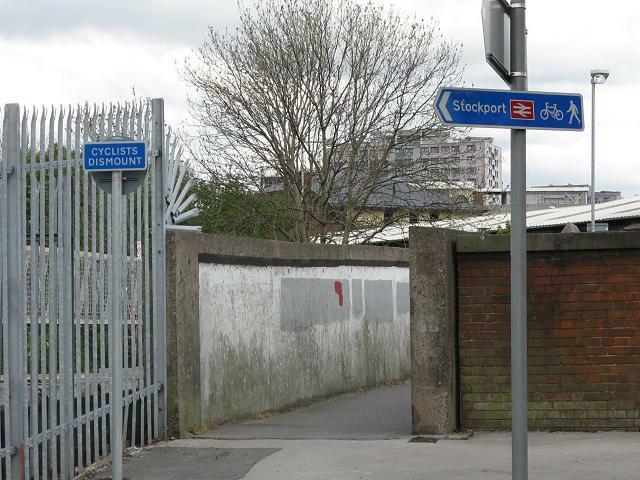 Unfortunately, 'CYCLISTS DISMOUNT' signs have been installed at both ends of the railway bridge, where 'Cyclists give way to Pedestrians' would have been much more appropriate. Not far behind the camera in the view above is a 'Toucan' crossing of King Street West. The direction sign seems a little unsure of itself. One step, forward, two steps back, you might say. This is the Thomson Street end. But, of course, most will ignore the signs, which we understand are 'advisory.' 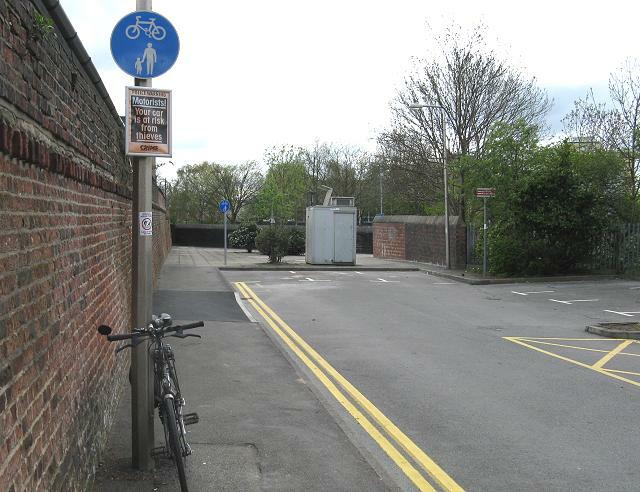 Obviously care is needed, just as it is on many other cycle routes, but given that cycling on the pavement is endemic in Stockport where are not there are any signs, what difference does it make? 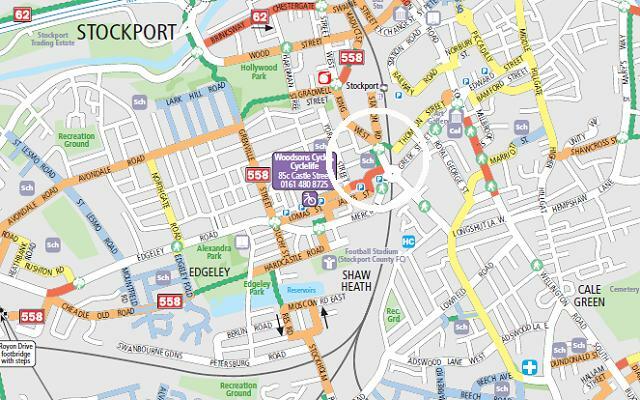 This map shows the link, which has been shown in green as an off-road route on the official Stockport Cycle Map for some time with no indication that it cannot be cycled. Less useful is this new short section of cycle lane meant to give access to the advanced stop area opposite Davenport station. Unfortunately, the road lane is simply not wide enough for even a normal car to avoiud blocking it, so it can never be used. 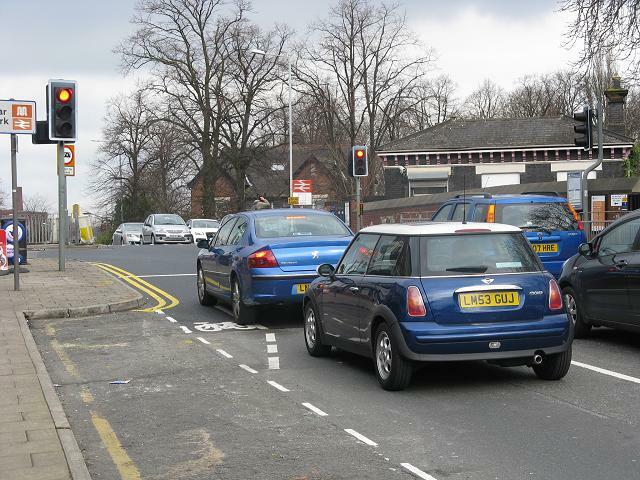 Furthermore, anyone heading straigh on down Bramhall Lane will realise they that they are trapped in a 'left-turn-only' lane with the route ahead blocked by a build-out and a bollard. Unsafe, in our view.